Mdina, or Città Notabile, is the old capital of Malta. 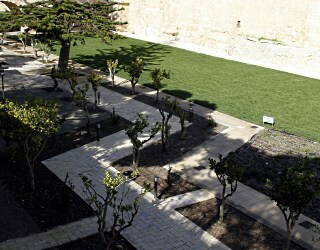 Mdina is a medieval walled town situated on a hill in the centre of the island. Punic remains uncovered beyond the city’s walls suggest the importance of the general region to Malta’s Phoenician settlers. The town is still confined within its walls, and has a population of just over three hundred, but it is contiguous with the village of Rabat, which takes its name from the Arabic word for suburb, and has a population of over 11,000. Evidence of settlements in Mdina goes back to over 4000 BC. It was possibly first fortified by the Phoenicians around 700 BC, because of its strategic location on one of the highest points on the island and as far from the sea as possible. When Malta had been under the control of the Roman Empire, the Roman Governor built his palace there. Legend has it that it was here, in around 60 AD, that the Apostle St. Paul lived after his shipwreck on the islands. 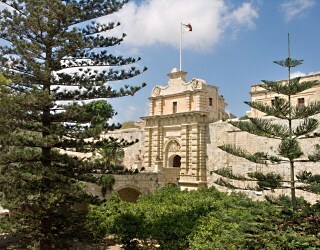 Mdina owes its present architecture to the Arab period, from 870 until the Normans conquered Malta in 1091. They surrounded the city with thick defensive fortifications and a wide moat, separating it from its nearest town Rabat. At the end of the Siege of Malta, the defenders of Mdina famously scared away the Turkish army that was retreating from their failed siege of the Knights of St. John at the future site of Valletta by firing their cannons, despite having very little ammunition. A strong earthquake in 1693 destroyed a large number of buildings in Mdina. 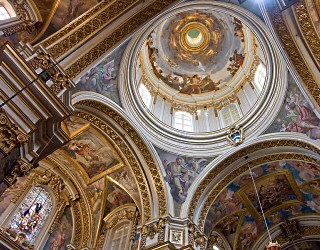 After the earthquake the cathedral was rebuilt on the designs of the Maltese architect Lorenzo Gafa and Baroque elements were introduced to the cityscape. Most of Mdina’s palaces serve as private homes. The impressive Cathedral of the Conversion of St Paul is fronted by a large square. Only a limited number of resident and emergency vehicles, wedding cars and hearses are allowed within Mdina, partly why it has earned the nickname “the Silent City”.